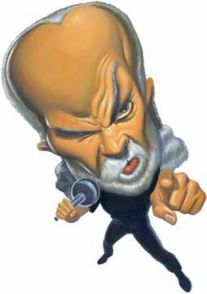 By and large, language is a tool for concealing the truth,’ read a message on Mr. Carlin´s Web site, GeorgeCarlin.com, and he spent much of his life in a fervent effort to counteract the forces that would have it so. 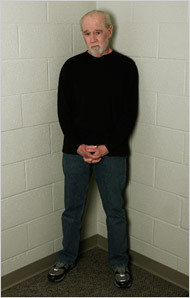 In his always irreverent, often furious social commentary, in his observations of the absurdities of everyday life and language, and in groundbreaking routines like the profane Seven Words You Can Never Say on Television,’ he took aim at what he thought of as the palliating and obfuscating agents of American life  politicians, advertisements, religion, the media and conventional thinking of all stripes. If crime fighters fight crime and firefighters fight fire, what do freedom fighters fight?’ he asked in a 1980s routine, taking a jab at the Reagan administration´s defense of the Nicaraguan Contras. 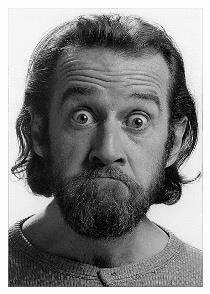 During a career that spanned five decades, Mr. Carlin emerged as one of the most popular, durable, productive and versatile comedians of his era. He evolved from Jerry Seinfeld-like whimsy and a buttoned-down decorum in the ´60s to counterculture hero in the ´70s. By the ´80s, he was known as a scathing social critic, wringing laughs from the verbal tics of contemporary language like the oxymoron jumbo shrimp’ (and finding another oxymoron in the term military intelligence’) and poking fun at pervasive national attitudes. He used the ascent of football´s popularity at the expense of the game he loved, baseball, to make the point that societal innocence had been lost forever. He dropped out of high school and joined the Air Force, and while stationed in Shreveport, La., he worked as a radio disc jockey. Discharged in 1957, he moved to Boston for a radio announcer´s job, then to Fort Worth, where he was a D.J. 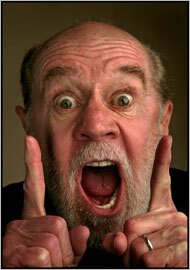 Mr. Carlin released his first comedy album, Take-Offs and Put-Ons,’ to rave reviews in 1967. He also dabbled in acting, winning a recurring part as Marlo Thomas´s theatrical agent in the 1960s sitcom That Girl’ and a supporting role in the 1968 movie With Six You Get Eggroll.’ He made more than 80 major television appearances during that time, including on the Ed Sullivan Show and Johnny Carson´s Tonight Show’; he was also regularly featured at nightclubs in New York and Las Vegas. He was one of America´s most popular comedians, but as the convulsive decade of 1960s ended, he´d had enough of what he considered a dinky and hollow success. By 1972, when he released his second album, FM & AM,’ his star was again on the rise. The album, which won a Grammy Award as best comedy recording, combined older material with his newer, more acerbic routines. 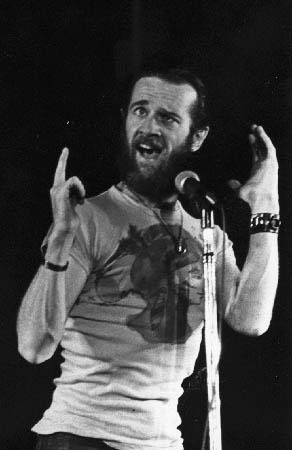 One, from Class Clown,’ Mr. Carlin´s third album, became part of his Seven Words You Can Never Say on Television,’ with its rhythmic recitation of obscenities. It was broadcast on the New York radio station WBAI. Acting on a complaint about the broadcast, the Federal Communications Commission issued an order prohibiting the words as indecent.’ In 1978, the Supreme Court upheld the order, establishing a decency standard that remains in effect; it ensnared Howard Stern in 2005, precipitating his move to satellite radio. Three of Mr. Carlin´s comedy albums of the 1970´s  Class Clown,’ Occupation: Foole’ and An Evening With Wally Lambo’  sold more than a million copies. 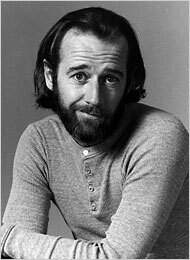 In 1975, he was chosen to host the first episode of the late-night comedy show Saturday Night Live.’ And two years later, he found the perfect platform for his stinging and cerebral, if sometimes off-color, humor in the fledgling world of cable television: the first of his 14 HBO comedy specials, George Carlin at U.S.C.’ was aired in 1977, the last, George Carlin: It´s Bad for Ya,’ in March. 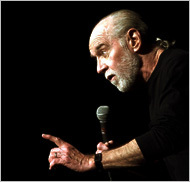 Stand-up is the centerpiece of my life, my business, my art, my survival and my way of being,’ Mr. Carlin once told an interviewer. 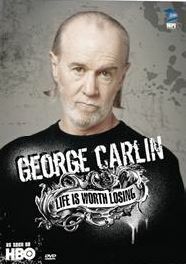 And while it did always take center stage in his career, Mr. Carlin also acted in films, among them Car Wash’ (1976), Bill and Ted´s Excellent Adventure’ (1989), The Prince of Tides’ (1991), and Dogma’ (1999). 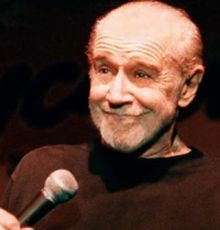 Mr. Carlin´s most recent work was especially contentious, even bitter, full of ranting against the stupid, the fat, the docile. But he defended the material, insisting that his comedy had always been driven by an intolerance for the shortcomings of humanity and society.